1911–2008, American physicist and educator, b. Jacksonville, Fla. Educated at Johns Hopkins (Ph.D., 1933), he joined the faculty at Princeton in 1938, and after 1976 was director of the Center for Theoretical Physics at the Univ. in mechanics, ratio of the force acting on a surface to the area of the surface; it is thus distinct from the total force acting on a surface. A force can be applied to and sustained by a single point on a solid. ..... Click the link for more information. and Hartland S. Snyder in 1939, nothing remains to prevent the star from collapsing without limit to an indefinitely small size and infinitely large density, a point called the "singularity." ..... Click the link for more information. become paramount. According to this theory, space becomes curved in the vicinity of matter; the greater the concentration of matter, the greater the curvature. When the star (or supernova remnant) shrinks below a certain size determined by its mass, the extreme curvature of space seals off contact with the outside world. The place beyond which no radiation can escape is called the event horizon, and its radius is called the Schwarzschild radius after the German astronomer Karl Schwarzschild, who in 1916 postulated the existence of collapsed celestial objects that emit no radiation. For a star with a mass equal to that of the sun, this limit is a radius of only 1.86 mi (3.0 km). Even light cannot escape a black hole, but is turned back by the enormous pull of gravitation. 1942–2018, British theoretical physicist, b. Oxford, England, grad. University College, Oxford, 1962, Ph.D. Trinity Hall, Cambridge, 1966. In 1962 Hawking was diagnosed as having an incurable muscular disease, amyotrophic lateral sclerosis (ALS). high-energy photons emitted as one of the three types of radiation resulting from natural radioactivity. It is the most energetic form of electromagnetic radiation, with a very short wavelength (high frequency). ..... Click the link for more information. , radio waves, and visible wavelengths that can be used to pinpoint the location of the disturbance. ..... Click the link for more information. announced that they had found conclusive evidence of a supermassive black hole in the M87 galaxy in the constellation Virgo. Since then others have been found, and in 2011 astronomers announnced the discovery of one, in NGC 4889 in the constellation Coma, whose mass may be as great as 21 billion times that of the sun. The first evidence (2002) of a binary black hole, two supermassive black holes circling one another, was detected in images from the orbiting Chandra X-ray Observatory. Located in the galaxy NGC6240, the pair are 3,000 light years apart, travel around each other at a speed of about 22,000 mph (35,415 km/hr), and have the mass of 100 million suns each. As the distance between them shrinks over 100 million years, the circling speed will increase until it approaches the speed of light, about 671 million mph (1,080 million km/hr). The black holes will then collide spectacularly, spewing radiation and gravitational waves across the universe. The Chandra observatory has also discovered that massive black holes were associated with galaxies that existed 13 billion years ago. Subsequently, the Laser Interferometer Gravitational Wave Observatory (since 2015) and the European Gravitational Observatory (since 2017) several times have detected gravitational waves that resulted from the merging of other black hole pairs. See S. W. Hawking, Black Holes and Baby Universes and Other Essays (1994); P. Strathern, The Big Idea: Hawking and Black Holes (1998); J. A. Wheeler, Geons, Black Holes, and Quantum Foam: A Life in Physics (1998); H. Falcke and F. W. Hehl, The Galactic Black Hole: Studies in High Energy Physics, Cosmology and Gravitation (2002); M. Bartusiak, Black Hole (2015). An object so collapsed that its escape velocity exceeds the speed of light. It becomes a black hole when its radius has shrunk to its Schwarzschild radius and light can no longer escape. Although gravity will make the object shrink beyond this limit, the ‘surface’ having this critical value of radius – the event horizon – marks the boundary inside which all information is trapped. Calculations, however, indicate that space and time (see spacetime) become highly distorted inside the event horizon, and that the collapsing object's ultimate fate is to be compressed to an infinitely dense singularity at the center of the black hole. It has also been shown that the distortion of spacetime just outside the Schwarzschild radius causes the production of particles and radiation that gradually rob the black hole of energy and thus slowly diminish its mass. This Hawking radiation (Stephen Hawking, 1974) depends inversely on the black hole's mass, so the most massive black holes ‘evaporate’ most slowly. A black hole of the Sun's mass would last 1066 years. Once matter (or antimatter) has disappeared into a black hole, only three of its original properties can be ascertained: the total mass, the net electric charge, and the total angular momentum. Because all black holes must have mass, there are four possible types of black hole: a Schwarzschild black hole (1916) has no charge and no angular momentum; a Reissner–Nordstrom black hole (1918) has charge but no angular momentum; a Kerr black hole (1963) has angular momentum but no charge; a Kerr-Newman black hole (1965) has charge and angular momentum. (The dates in brackets indicate when the named mathematician(s) solved the equations of general relativity for these particular cases.) In astrophysics the simple Schwarzschild solution is often used, but real black holes are almost certainly rotating and have very little electric charge, so that the Kerr solution should be the most applicable. The most promising candidates for black holes are massive stars that explode as supernovae, leaving a core in excess of 3 solar masses. This core must undergo complete gravitational collapse because it is above the stable limit for both white dwarfs and neutron stars. Once formed, a black hole can be detected only by its gravity. Finding black holes only a few kilometers across (the size of the event horizon for a single-star black hole) is exceedingly difficult, but chances are increased if the black hole is a member of a close binary system. If the components of a binary system are close enough, mass transfer can occur between the primary star and its more compact companion (see equipotential surfaces). Matter will not fall directly on to the companion, however, for it has too much angular momentum; instead it forms a rapidly spinning disk – an accretion disk – around the compact object. If the latter is a black hole considerable energy can be produced, predominantly at X-ray wavelengths, as matter in the accretion disk loses angular momentum and spirals in. When the accreting matter is unable to cool efficiently, most of the energy generated in the disk due to viscosity is not radiated away, but instead stored in the gas as internal energy and advected inward in an advection-dominated accretion flow onto the central object. Candidates for black holes in a binary system fall into two classes, massive and low-mass black-hole binaries, depending on the mass of the companion star. The first massive black-hole candidate to be identified was the X-ray binary Cygnus X-1, comprising a 20 solar mass B0 supergiant accompanied by an invisible companion with a mass about 10 times that of the Sun. This massive nonluminous object is probably a black hole emitting X-rays from its accretion disk. Another promising massive black-hole candidate is the X-ray binary LMC X-3 in the Large Magellanic Cloud. While the probable mass of the compact objects in this system is of the order of 10 solar masses, rigorous lower limits are as low as 3 solar masses (possibly even lower), marginally consistent with the maximum theoretically predicted mass of a neutron star. Even better evidence for a stellar-mass black hole comes from some of the low-mass black-hole candidates, in particular A0620-00 in Monoceros and V404 Cygni. Rigorous limits on the masses of the compact objects in A0620-00 and V404 Cygni are 3 and 6 solar masses, respectively. See also gamma-ray transients. Supermassive black holes of 106 to 109 solar masses probably lie in the centers of some galaxies and give rise to the quasar phenomenon and the phenomena of other active galaxies. If a huge black hole is able to form and to capture sufficient gas and/or stars from its surroundings, the rest-mass energy of infalling material can be converted into radiation or energetic particles. There is now observational evidence to support this hypothesis. the dynamical motion of stars and ionized gas in the cores of nearby galaxies show that they are responding to a strong gravitational field, in excess of that expected from the number of stars accounting for the light at the galaxy center. These motions are thought to be due to the presence of the supermassive black hole (see Seyfert galaxy; Virgo A). Other strong evidence for the presence of supermassive black holes is found from recent observations of an extremely broad iron fluorescence line in the X-rays from several Seyfert galaxies; this line has a very particular shape, revealing its origin in an accretion disk very close to the central black hole. At the other mass extreme are the more speculative mini black holes, weighing only 1011 kg and with radii of 10–10 meters. These could have formed in the highly turbulent conditions existing after the Big Bang. They create such intense localized gravitational fields that their Hawking radiation makes them explode within the lifetime of the Universe; their final burst of gamma rays and microwaves should be detectable but has not yet been found. a celestial object that is formed as a result of the relativistic gravitational collapse of a massive body. In particular, the evolution of a star whose mass at the moment of collapse exceeds some critical value may terminate in catastrophic gravitational collapse. The value of the critical mass is not precisely determined and, depending on the equation of state of matter used, ranges from 1.5 to 3 solar masses (Mʘ). For any equation of state of matter, the general theory of relativity predicts that no stable equilibrium exists for cold stars of several solar masses. 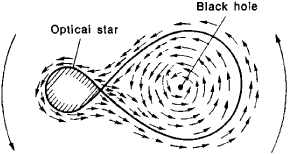 If, after a star becomes unstable, not enough energy is released to halt the collapse or to cause a partial explosion after which the remaining mass would be less than the critical mass, the central portions of the star collapse and, in a short time, reach the gravitational radius rg. No forces whatsoever can prevent the further collapse of a star if the radius of the star shrinks down to rg, which is also known as the Schwarzschild radius and is the radius of a sphere whose surface is called the event horizon. A fundamental property of the event horizon is that no signals emitted from the surface of the star and reaching the event horizon can escape from the region inside that horizon. Thus, as a result of the gravitational collapse of a massive star, a region in space-time is formed from which no information whatsoever about physical processes occurring within the region can emerge. A black hole has a gravitational field whose properties are determined by the hole’s mass, angular momentum, and—if the collapsing star was electrically charged—electric charge. At large distances, the gravitational field of a black hole is virtually indistinguishable from the gravitational field of a normal star. In addition, the motion of other objects that interact with a black hole at large distances is governed by the laws of Newtonian mechanics. Calculations show that a region known as the ergosphere, which is bounded by a surface called the static, or stationary, limit, should exist outside the event horizon of a rotating black hole. The attractive force that a black hole exerts on a stationary object situated in the ergosphere tends to infinity. However, the attractive force is finite if the object has an angular momentum whose direction coincides with that of the black hole’s angular momentum. Therefore, any particles that happen to be in the ergosphere will revolve around the black hole. The presence of an ergosphere may lead to energy losses by a rotating black hole. In particular, energy losses are possible in the case where some object that has entered the ergosphere breaks up (for example, as a result of an explosion) into two fragments near the event horizon of the black hole. In this case, one of the fragments continues to fall into the black hole, but the other fragment escapes from the ergosphere. The parameters of the explosion may be such that the energy of the fragment that escapes from the ergosphere is higher than the energy of the original object. The additional energy in this case is drawn from the rotational energy of the black hole. As the angular momentum of a rotating black hole decreases, the static limit comes closer to the event horizon; when the angular momentum is zero, the static limit and the event horizon coincide and the ergosphere disappears. Owing to the effects of the centrifugal force of rotation, the rapid rotation of a collapsing object prevents the formation of a black hole. Therefore, a black hole cannot have an angular momentum that is greater than some extreme value. Quantum-mechanical calculations show that particles—such as photons, neutrinos, gravitons, and electron-positron pairs—may be produced in the strong gravitational field of a black hole. As a result, a black hole radiates like a blackbody with an effective temperature of T = 10–6 (Mʘ/M) °K, where M is the mass of the black hole, even in cases where no matter whatsoever falls into the hole. The energy of the radiation is drawn from the energy of the black hole’s gravitational field; as a result, the mass of the black hole decreases with time. However, owing to their low efficiency, the quantum radiation processes are unimportant for massive black holes, which are formed as a result of stellar collapse. In the early stages of the evolution of the universe, which were hot and ultradense, black holes with masses ranging from 10–5 g to a solar mass or higher may have been formed as a result of an inhomogeneous distribution of matter. In contrast to the black holes that are formed by collapsed stars, these objects are called primordial black holes. Since quantum radiation processes reduce the mass of a black hole, all primordial black holes with a mass of less than 1015 g should have evaporated by the present time. The intensity and effective temperature of black-hole radiation increase as the mass of a black hole decreases. Therefore, in the final stage, the evaporation of a black hole with a mass of the order of 3 × 109 g would be an explosion accompanied by an energy release of 1030 erg in 0.1 sec. Primordial black holes with a mass of greater than 1015 g have remained virtually unchanged. The detection of primordial black holes on the basis of their radiation would make it possible to draw important conclusions about the physical processes that occurred in the early stages of the evolution of the universe. The search for black holes in the universe is a task of current interest in modern astronomy. Searches are carried out on the assumption that black holes may be the invisible components of certain binary star systems. However, this inference is not definite, since the normal star in a binary system may be invisible against the higher luminosity of the second component. Another method of identifying black holes in binary systems is based on the radiation emitted by matter flowing from the companion, which is a normal star, to the black hole. In this case, a disk consisting of matter flowing to the black hole is formed near the hole; the layers of the disk move around the hole with various velocities (see Figure 1). Owing to friction between adjacent layers, the matter in the disk is heated to tens of millions of degrees. The inner regions of the disk emit energy in the X-ray region of the electromagnetic spectrum. The same type of radiation is produced in the case where a binary system contains a neutron star rather than a black hole. However, a neutron star cannot have a mass higher than some limiting value. As a result of space studies, a large number of X-ray sources in binary systems have been discovered. The X-ray source Cygnus X-l is the most likely candidate for a black hole. In this binary system, the mass of the X-ray source, which may be estimated from the observed orbital velocity of the optical star and from Kepler’s laws, exceeds 5 Mʘ, that is, is higher than the limiting mass for a neutron star. The hypothesis has also been advanced that supermassive black holes—that is, black holes with a mass M ≃ 106–108Mʘ—may be located in the nuclei of active galaxies and in quasars. In this case, the activity of the active galactic nuclei and quasars is attributed to the infall of ambient gas onto the black hole. Zel’dovich, Ia. B., and I. D. Novikov. Teoriia tiagoteniia i evoliutsiia zvezd. Moscow, 1971. Penrose, R. “Chernydyry.” Uspekhi fizicheskik nauk, 1973, vol. 109, issue 2. Frolov, V. P. “Chernye dyry i kvantovye protsessy v nikh.” Uspekhi fizicheskik nauk, 1976, vol. 118, issue 3. Shakura, N. I. Neitronnye zvezdy i “chernye dyry” v dvoinykh zvezdnykh sistemakh. Moscow, 1976. Novikov, I. D. Chernye dyry vo Vselennoi. Moscow, 1977. A region of space-time from which nothing can escape, according to classical physics; quantum corrections indicate a black hole radiates particles with a temperature inversely proportional to the mass and directly proportional to Planck's constant. An expression which depends on its own value or a technique to detect such expressions. In graph reduction, when the reduction of an expression is begun, the root of the expression can be overwritten with a black hole. If the expression depends on its own value, e.g. Where an electronic mail message or news aritcle has gone if it disappears mysteriously between its origin and destination sites without returning a bounce message. Compare bit bucket.